Rubio appears to be making the case that he would have liked to have achieved his goals without having to shut down the government, and that he would have been happy to fund the government fully if doing so was paired with provisions defunding or delaying Obamacare. He may have felt that way, but both of the specific claims he makes are problematic. His claim that "I never was in favor of shutting down the government" is undercut by two separate comments in which he supported a strategy of opposing Obamacare even if that meant rejecting a bill that would have kept the government open. And on the question of whether he "voted to fund the government fully," he arguably may have done so once, but took the opposite position nine times. Given the political realities of the budget battle, Rubio's words and actions suggest he wanted Obamacare defunded more than he wanted to keep the government open. Set aside for a moment that it's impossible to determine the factual accuracy of Rubio's feelings. 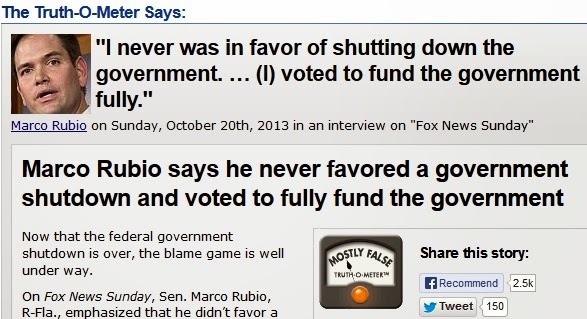 And let's forget the reality that if Rubio "voted to fully fund the government" even once, as PolitiFact admits he did, then his claim is an actual fact. 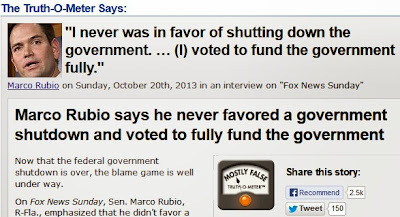 For now, we'll just point out PolitiFact's logic: If Rubio had really wanted to keep the government open, he wouldn't have been so supportive of the specific tactics used. Rubio said the defense cuts known[sic] that are part of sequestration were Obama’s "idea in the first place." That doesn’t tell the whole story -- particularly the fact that Obama does not favor these cuts. The White House proposed them as a means of driving the two sides to a compromise over the deficit, not as a real-world spending plan. You see, in PolitiFact's world, the fact that the sequester cuts were "Obama's idea in the first place" is somehow less of a fact because Obama had good intentions. It was just a negotiating tool! Those coots in the GOP weren't supposed to call his bluff! In one case, Rubio bears the full responsibility for his actions, regardless of his stated motivations. Obama, on the other hand, bears no burden for his negotiating tactics if they don't turn out the way he wanted. Facts are not like Burger King hamburgers. You cannot have them your way. What this all points out (again) is that PolitiFact operates more as a liberal op-ed than an actual fact checking unit. PolitiFact applies its standards inconsistently to fit whatever narrative they want to push. It's uncomfortable to accept Obama's role in the sequester, so they mitigate it. But they're not about to let Rubio get away with pretending he didn't want to shut down the government. This is just another example in a long history of PolitiFact's incoherent and sometimes contradictory rulings. Until PolitiFact can adhere to a consistent set of standards it should be considered liberal punditry.